I am happy to say that the quilt project stayed "dreamy" and did not disintegrate into nightmare. One week - start to finish - with a sickly toddler, a bad cold, and a bout of pink-eye in between, just to keep things interesting. I did not take pictures of it last night but will try to add a photo here later. The auction is Saturday night. 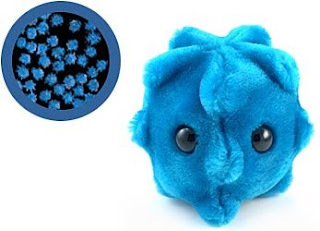 ..and unfortunately it is not this cute one from Think Geek. Luckily it is just the start of something - runny sneezy itchy nose - but it was enough to make me forgo any quilting last night. Somehow trying to match points while simultaneously blowing my nose sounded dangerous - I would be afraid I would grab a pin instead of a tissue and then there would be trouble. Tonight is a night off, too - dinner at the in-laws. It's a Saturday evening thang. Back to the quilt on Sunday. A couple of sneak previews. The name comes from my co-worker, whose last name is Winter - and who wore a cream and brown and black sweater the day I headed upstairs to pull the fabrics for this. The blocks are done, and the blocks are joined in rows. Tonight I need to connect the rows together and attach the borders. I have flannel for the back. I hope to be done by Monday - at this rate it should not be too much of a problem to make that goal. Time so far - 4 hours. I am currently working on the speediest quilt I think I have ever made. I made the decision on Tuesday night (1/22) to make this quilt, and it needs to be done by next Friday (2/1). That amidst a full time job and some other activities going on. I put 2 hours into it last night - and it is well on it's way. Thank goodness for a full studio of leftover fabrics and a relatively simple pattern. I plan to tie it - so even that won't be too bad. The quilt is for a fundraising silent auction in conjunction with a chicken BBQ to help raise money for some special friends who are dealing with cancer and its related issues. So if you plan to be in the neighborhood of Rochester, NY on February 2nd and have a hankering for a taste of summer and the best chicken BBQ around, let me know and I can get you some tickets. 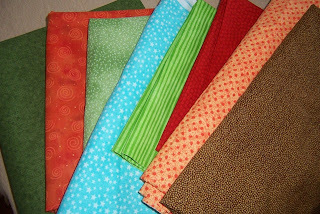 There are also some special fabrics worked in - fabrics from my son's baby quilt, fabrics purchased for a fundraiser for one of the people organizing THIS one, fabrics purchased with my sister on a mini-shop-hop. To top it off - I made a quilt for Christmas and miscalculated on the binding - and made WAAAYYYY too much binding before I realized it. (enough for a king - and I made a throw) - but it is brown speckled - so I can use it to bind this quilt. So I guess this quilt was really meant to be. It is the least I can do - and I will be thinking of them with every stitch. Sometimes I get these ideas in my head - and then start flying without a net, or creating without a pattern. I've been wanting to do a "countdown calendar" since my son was born in 2005. See - my husband, my son, and I all share February as our birth month. Hubby was born at the end of the month, so he has always celebrated all month long. Piggybacking on this, I decided that all three of us should celebrate the month, and decorate the house accordingly. Being February, I wanted to avoid the hearts and flowers of Valentine's Day, but wanted something bright and cheerful. I started by making a denim tablecloth and bordering it with large squares of multi-colored fun fabric - in lime, yellow, red, orange and bright blue. We have used that as our Tablecloth of the Month for 2 years now. So the countdown calendar had to be something as bright and fun. I had some remnants, and went looking for more of the same fabrics. I ended up with complimentary fabrics and was able to put together most of the project yesterday. Each day is a 3 inch square pocket - with special Happy Birthday fabric for the pockets of our birthdays. I have number and letter beads to hang from the points of each flap, and the whole thing will have a lime green binding around it and hang on the wall in our dining room. We plan to put little notes or gifts in the pockets and open them up as the month goes along. The all red pocket on the bottom of the 2nd column is Valentine's Day - it will have a little heart charm added to it. I also plan to make a little pouch/pocket that will button onto the bottom with a "29" on it that we can hang every 4 years. I have never worked with prairie points - so this is new for me. I chose not to topstitch them as the piece was already rather busy and I did not want the distraction of the extra stitches. "Most" of them are folded and pressed straight. A few went wonky in the assembly process. The only other thing that I did that I would do differently was that I added 1/4" to the height of the blocks that the pockets are stitched to (each pocket is lined) - so you can see a bit of that out from under the corners of the prairie points. Not having worked with those, and wanting to leave a bit of room for large (and small) fingers to get into the pockets, I thought it would be a good idea. In hindsight, I would not do that. Luckily I had enough of the blue stars to use for those squares instead of the scraps I was planning to use - so at least it looks coordinated. I will post pictures later this week or early next week when it is all ready to hang. ...the fabric photo posted yesterday was NOT the fabric I purchased - it was dreamy fabric I just ogled online - and that JoAnn's does NOT carry. ...this is what I actually ended up with - and will all make sense when you see the 3 very different finished projects it is targeted for. A few weeks before Christmas, I was inspired to ask my sister-in-law if she would be willing to knit me a sweater. Knitting is one of those things that I learned when I was young, but never really stuck with - so knitting a sweater is so far beyond my capacity. In fact I don't think I ever knit anything bigger than a blanked for my Sunshine Family dolls. But Jeanne on the other hand - now she can knit. She had made her mom a sweater - and I wanted one just like it, only in a different color. So I picked out and purchased my yarn, and Jeanne got to knitting. Even with Christmas projects and all sorts of other things going on, she managed to churn out a GORGEOUS sweater, seemingly in no time at all! I love it - it is cozy, comfortable, soft and perfect in every way! So why is it a "Mom" sweater? Good thing it is machine washable! 40% off sale at JoAnn's on their quilting fabric (not the premium stuff - but the other stuff)... AND I get out of work early today AND I have a shopping list. Good thing I cleaned up some space in the attic! If I am not home by 5:00 PM, you know where to find me! I just did not want anyone to worry that I got buried under an avalanche of boxes or fabric or paper last night. I did NOT have an avalanche -but the potential has been there. I worked through a whole bunch of plastic shoeboxes last night - and did the whole "Clean Sweep" sort of keep, sell(donate) or trash. Things (some things) got put back in their proper storage areas and great progress was made. I actually emptied five - yes FIVE - shoeboxes that can now be used for other purposes. Woo hoo!!! Photos? Not just yet - but soon! My "studio" is our attic - a nice large space where I can spread out all my projects and close the door to keep out curious kitties when needed. Unfortunately, this space is also our primary storage area AND contains a small play area for the Munchkin to keep him safely occupied when Momma needs to have him play upstairs while she is working on something. Sometimes the multiple spaces do NOT get along. Especially around the holidays, when we need to get into the deep storage crawlspace to pull out all the decorations, the organization of the rest of the room suffers. Right now it looks like EVERYTHING exploded and is sitting in the middle of the room - toys, supplies, storage boxes, books - it is chaos. My goal this month has been to bring the "studio" back, and clean up the play area, so the Munchkin and I can get back down to business - playing!!! Two nights ago I went up to "dig" - and was so overwhelmed I threw in the towel, took a stack of old books and magazines off the bookcase and took them back downstairs to evaluate and purge. Half are now in the "Freecycle" pile. Emboldened by that small victory, I dared the stairs again last night and made better progress - but still not enough to post an actual photo of the space for all to see. I feel like I am eating an elephant - one bite (or evening) at a time. Hoping for a quick and painless victory -soon! ...this was totally randomly generated - honest! I think it is a pretty good recipe! I am pondering what photo vintage I am. No -not vintage photos, though it was the handling of some old photos that brought on this musing - but photo vintage. Kind of like wine - different vintages for different periods. I am a slide vintage - compounded by being child #6. While there are photos of me from various years -many are buried in slide trays or old negatives. My son is digital all the way - although I think there are a couple of traditional film shots of him, somewhere...Add that to him being an only child - and look out! I could have filled a room full of prints and negatives if we were still using film! I tackled the digitizing of my family slides a couple of years ago - time consuming, but well well worth the effort. Now to dive into another stack of prints and get them scanned in. I guess in the end I am taking us all digital. But I still love those old sepia prints - mmmmmm. Even the ones where I have no idea who the people are. I used to be really bad about needing the latest and greatest - especially when I was very very actively rubber stamping. Of course having a family stamp shop did not make that any easier to resist. As I later got into quilting, I realized more and more how I could multitask my tools - using a quilting rotary cutter and ruler with a blade just for paper to cut out cardstock nice and square, or using my rubber stamping tools in my scrapbooking, and I got more selective, buying more materials than tools. A friend of mine recently posted a wonderful narrative about one of her favorite tools. This is one of my most used tools as well, and probably has tons of stories to tell, although mine has only seen one user. My hubby once sent me a card when we were dating - a funny card that was all about how everyone needs socks - socks in the shower, socks in bed, socks just about anywhere. OK - so it was a little suggestive - but it's been close to 15 years and I still remember that card. I think I still have it somewhere. On the other hand - a great pair of socks is like a little hug for your feet - adding a little spring to your step. They can also be that little indulgence - something fun in an otherwise conservative outfit - since you only flash a little at the ankle - something just you know about. I got just such a pair of socks for Christmas - the perfect combination of fun and function. And the best part -they were made JUST FOR ME - by my wonderful Lazy Sister Sue. I've worn them all day already - twice - including to work on my first working day of the new year! Talk about stepping out in style! Everyone needs socks - but you can't have these - they are ALL MINE!!! OK - true confession time - I am a wallet watcher. ...it means that I watch wallets. Not everywhere, but in my job proctoring exams I have to ask people for their ID, and I get to watch what kind of wallet they are carrying. Eight people a day - eight different wallets - five days a week. So I am up to a 40 wallet a week habit - more or less, as some people just stick their ID in their pocket and leave the wallet at home. I watch the women's wallets more than the mens. I have gone through various wallet phases in my life - the checkbook and big wallet all in one, the wallet/purse on a string, wallets with zippers and lots of pockets, and ID holders on keychains with the Clemson logo on them. So it is interesting to see what my testers - mostly college seniors or about that age - are carrying. I see all of the above - as well as a few duct tape wallets. But today I actually saw my favorite - and the wallet I am currently carrying myself - a Lazy Girl Wonder Wallet. The owner is a budding Lazy Girl herself - and before she leaves here today I will be getting her the information on the Lazy Girl Yahoo Group - as well as showing her the new Miranda pattern!! And I will get back to my wallet watching - and see what else walks through my door.